This week is National Eating Disorders Awareness week. The goal of the National Eating Disorders Association is simple…to eventually prevent all eating disorders from occurring. But it won’t be an easy battle. It’s estimated 11 million people suffer from anorexia and bulimia. 10 million of those people are women. The mortality rate among anorexic girls between 15-24 years old is 12 times higher than any other illness. 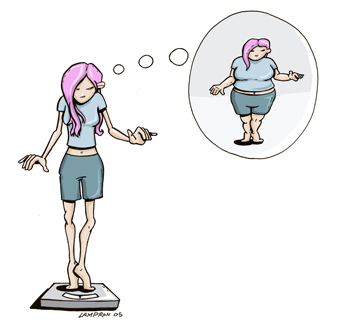 40% of new cases of anorexia is in girls between 15-19 years old. As for why girls turn to such drastic measures as starving themselves, abusing laxatives or bingeing and purging, consider this: 81% of 10 year olds are afraid of being fat. It’s easy to blame the media and fashion industry for those numbers. Afterall, models are 98% thinner than the average American woman. But girls also get their cues from their mothers. And if their moms are a frequent rider on the diet rollercoaster, odds are the daughters will grow up fearing and dreading weight gain. Click here to learn more about NEDAwareness week and what you can do to help stamp out eating disorders. This entry was posted on February 22, 2011 at 7:37 am and is filed under Body Image, Health Crisises. You can follow any responses to this entry through the RSS 2.0 feed. You can leave a response, or trackback from your own site.